Regular cycling is a valuable, healthy form of exercise under a person’s control which strengthens heart and lungs, and puts no strain on the body. It makes you have a better mental well-being by reducing stress and making you look better as well as helping you to live longer. 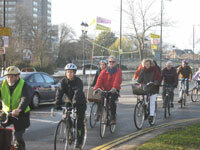 Cycling produces no harmful pollutants and virtually no noise and is the cleanest form of transport. It can make for more pleasant communities with better air quality, lower carbon emissions and reduced congestion as well as promoting social interaction. Cycling is the most inexpensive form of independent door to door transport, apart from walking, with no fuel or parking costs and low cost maintenance. A good bicycle will last for years, if not decades. Cycling is a quicker alternative to the car or public transport for many short trips, particularly for travel in peak traffic conditions. It is possible to time a journey to the minute and rely on it. Traffic congestion can be ignored. Cyclists can dismount and walk the ‘wrong’ way up one-way streets or along pedestrian only alleyways, giving easy access to the town centre and other destinations. A bicycle can be easily parked outside the building you are visiting. Twelve bicycles can be parked in the space of one car.